For the year and a half we lived with an ocean between us, we sent this image back and forth to each other. 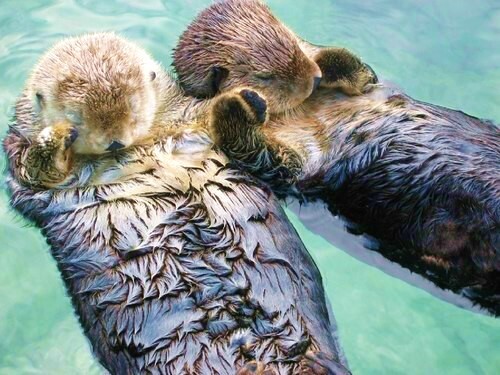 Sea otters hold hands when they sleep so they never drift apart. Do you remember? I was a Resident Advisor in the girls dorm and you in the boys. We were from different worlds, living in separate towers, but it was just a matter of time before our paths crossed. No matter that you had spent your life traveling the world as the son of an Army soldier. No matter that I had remained in the same town I was born for the first seventeen years of my life, with never an illusion of going elsewhere. It was just a matter of time. You spoke up during a weekly meeting, and our eyes met across the room. I would later learn just how outspoken you could be when you believe in something. You’re always up for a good debate, and passionate about your beliefs. I love that about you. Do you remember? We danced the nights away, every two-step taking our friendship to a deeper level on a path to a future we never imagined. Well, you did from the start didn’t you? It was I that needed convincing. It was I that was too fearful of losing my best friend by wading into uncharted territory of romance and stolen kisses. Yet, I was chest deep from the beginning without even knowing it. It was just a matter of time. Do you remember? You worked the night shift at the front desk, and rushed up to your room for a little sleep. Most mornings you woke to the phone ringing and my voice asking you to come down for breakfast with me. I would wait in the Commons Area sometimes ten minutes, sometimes longer. Then, you would exit the elevator, sleepy-eyed and ruffled hair, missing your warm bed I’m sure…but you would always come. It was just a matter of time. Do you remember? We planned a road trip to visit my family, but the day before we were scheduled to leave my car broke down. We booked two tickets on the Greyhound bus. Two poor college students, with a bag full of change we hit the vending machines at every stop while the rest of the passengers enjoyed a warm restaurant meal. The bus stopped at every tiny, out-of-the-way town. It took us twice as long to reach our destination, but for us it was the ride of a lifetime. It was just a matter of time. Do you remember? Early on in our marriage, we would walk the store aisles creating a wish list of items with which we would one day furnish our first family home. We dreamed of the day we could afford it all, sit back, and take immense pleasure in watching our children enjoy it. We had big dreams, and spent years making them a reality. It was just a matter of time. Do you remember? My dad was diagnosed with cancer, his battle lasting only four months. I moved back home to help my mom sort things out emotionally, physically, and financially. The morning of my departure, I rushed around aimlessly trying to get packed while I was completely out of sorts. You made me stop, played our favorite song as we slow danced in the living room, savoring each moment, not knowing how long we would be apart. Six months later, you picked me up at the airport with flowers in hand and I ran into your loving arms. It was just a matter of time. Do you remember? You asked for my dad’s permission to marry me, when you realized his days on earth were numbered. You said you wanted him to rest peacefully knowing his daughter was loved and cared for…you weren’t yet a father, but you knew what it would mean to him. Some thought we were rushing things, but we knew we would eventually marry. It was just a matter of time. Do you remember? I remember all these moments and so many more that have left an indelible imprint on my heart and my soul. Our love is made up of these memories, these moments, telling a love story like no other…our story. “For better or for worse.” “In sickness and in health.” “For richer or for poorer.” Marriage vows one speaks without truly understanding the meaning of them at that moment. Ceremonial words shared easily at a time when we can only imagine a bright and carefree future. Eighteen years later, we have lived these words and gained a deeper and first hand understanding of them. It has made our bond stronger, our life fuller, and our love richer. It was just a matter of time. ← You Don’t Know Me, But I Attended Your Dad’s Funeral Today. This was so good!!!! I was crying half way through! Thank you for reading. I appreciate your comment. Great post–very sweet and touching. What a special Valentine’s Day weekend gift for us all! Thank you for your visit, and for taking the time to read and comment. I appreciate it. Enjoy your weekend! Beautiful story! Thank you for sharing it !! That was so romantic!! No wonder you are so happy together. Congratulations. Not many can speak so lovingly after 18 years. He is a lucky man. Thank you. I tell all my singke girlfriends how important it is to be friends above all else. When life throws you curve balls, there’s no one better to have by your side. Enjoy your weekend my friend! Happy Day Of Love to you, littlemisswordy! Keep the plant of beauty well-watered. This is love, just love. Thank you Vivien! I’m definitely going to keep watering and appreciating what we share. I hope you’re having a great weekend. Okay, you did it again! You brought tears to my eyes. Your story about young love obviously hits close to home. The scene of you two traveling by bus with pocket change really struck a chord with me. My husband and I had a rocky start financially. Maybe that’s why I cooked Hamburger Helper often because that’s all we could afford. I feel a little richer today knowing that another couple across the country is also celebrating their gift of friendship and love! Oh Miss Wordy…that paragraph about your Dad and his passing and your husband taking the time (you couldn’t) to nurture you. It’s hard to breathe, really, that is so moving to me. You 2 are inspirational! Thank you so much for your words. We definitely treasure what we have. Happy Valentine’s Day to you. beautiful…true…straight from the heart…thank you for sharing! Simply beautiful! What a great love story! Thank you. Happy Valentine’s Day to you and your family! So beautiful! I hope your husband appreciates it. Thank you. He did! He was on an airplane this morning when I posted so he didn’t get to read it until later in the day. He loved it. Happy Valentine’s Day to you! Awwhh…thank you so much. Happy Valentine’s Day to you! Thank you. Sorry for the tears, and hope you have a happy Valentine’s day. It’s ok, they were happy (ish) tears. I’m a sucker for romance. You should have seen me at my Grand parents 60th wedding anniversay do! Thank you. Happy Valentine’s Day Terry. Did your brother love the chocolate cake? Thank you. Happy Valentine’s Day to you! Thank you! I had a feeling you would like the otter picture. 😉 Happy Valentine’s Day! You have a way with wordies, Miss Wordy. I’m a Valentines Day sap too. It’s a bummer when you don’t have anyone to spend it with…or the other 364 days with for that matter. Enjoy yours. Sounds like you already started! I am quite wordy aren’t I? 😉 From one sap to another, I think it’s a beautiful thing to be a Valentine’s Day sap! Loved your virtual date with Becca. Happy Valentine’s Day my friend! Happy Valentine’s Day to you my friend! What a beautiful story. It is truly an amazing path our lives take when we just let faith take us where we are supposed to go. You guys share something wonderful and that is something to be grateful for. That is the most beautiful love letter ever written. Thank you. Happy Valentine’s Day! What a beautifully written post. Happy Valentine’s Day!